Definition: In England and Wales there are different types of tribunals which hear different types of cases from the courts, typically involving immigration and employment issues. Tribunals are often more informal than courts and often parties do not have legal representation. 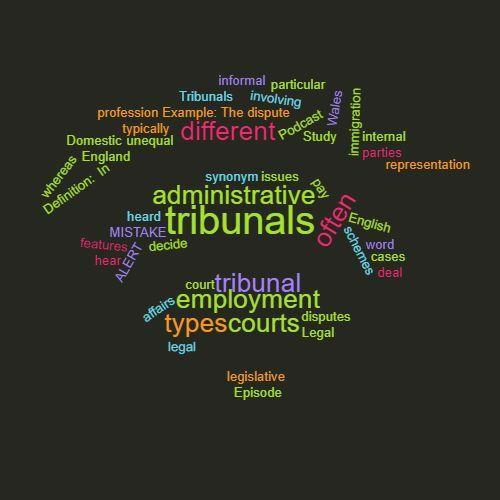 Domestic tribunals deal with the internal affairs of a particular profession whereas administrative tribunals decide disputes about administrative or legislative schemes. MISTAKE ALERT! : A tribunal is not a synonym for a court. Example: The dispute over unequal pay was heard by the employment tribunal. This word features in Episode 46 of the Study Legal English Podcast.